Twin sisters meet for the first time at their mother’s funeral. That’s the unusual premise for this interesting YA tale about family ties. 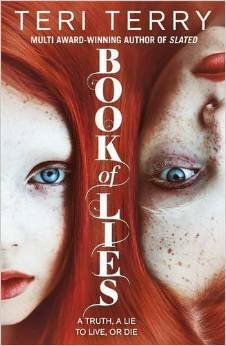 The Book of Lies is one of many books for teen audiences in the ‘magical realism’ genre; firmly grounded in the reality of modern day life, with enough of the extra-ordinary not to be a ‘contemporary’ novel, but not enough world building to qualify as ‘urban fantasy’. These novels tend to use magic as a convenient way to help characters explore different emotions or themes. In this case the book explores sisterhood and family ties, and the lies that can bring us together or tear us apart. The story switches perspective between Piper and Quinn, twin sisters who have been separated since birth. Quinn was raised by her strict grandmother, with occasional visits by her mother who despised her. Piper lives the life of a popular high schooler, complete with friends (or followers), a boyfriend, and apparently doting parents. When their mother is killed, suddenly and violently, the sisters meet for the first time and become entangled in an ancient prophecy neither of them is aware of. When I read the blurb I honestly expected this to be a high fantasy or at least urban fantasy read. It sounds like a creepy, mysterious, nightmare-inducing thriller you need to read with all the lights on. And so my biggest challenge with this novel was overcoming my preconceived notions of what it would be about. Once I had come to terms with the setting I did enjoy the flow of the plot. Quinn was an interesting character, and I enjoyed watching her gain confidence in herself. The main thing that I liked about The Book of Lies, which is not enough for me to rate the book higher, was the premise. I enjoyed thinking about it from every different angle and exploring the series of events that led to twins meeting for the first time at their mother’s funeral. There is a kind of morbid poetry about it, and I think Terry missed an opportunity to dwell on that further. When I really dig into what I did and didn’t like there is not much in the former column at the end of the day. While I can honestly say that I enjoyed the experience of reading it, there were some serious flaws. The majority of the characters, in fact all of them except Quinn and her grandmother, are cardboard caricatures I felt no empathy for or interest in. There are plot-based reasons for some of this, when it comes to Piper’s father and boyfriend, but I don’t think that is an excuse for the vague and seemingly random way the side characters expressed emotion. Piper herself was a disappointment. I had hoped from the very beginning that she would become a more complex, nuanced character, but has her chapters revealed more and more about her she became harder and harder to care about. My final criticism is the ending. The drama of the final chapter, as the story comes to its conclusion seems an appropriate place to leave the story. Yes there would have been loose ends, but the alternative was a disappointment. The final section is the epilogue, set 5 years later, and while it answers many of the questions of the ‘fantasy’ elements of the book, I think there is a lot to be said for authors who resist the urge to over-explain to readers. In summary, this book was a disappointing read for me, but there were definitely some unusual elements about this story that intrigued me. I think this book would suit YA fans who are looking to step outside contemporary and would like to just dip their toes into fantasy.